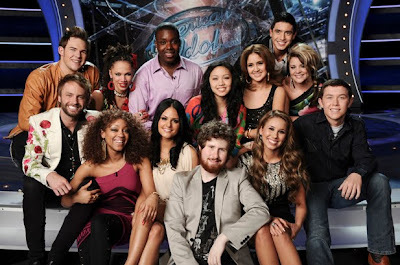 >Here is the list of the top 12 American Idol contestants for season 10. Casey Abrams (A front runner, the judges love him and so do a lot of viewers), 20 years old from Idyllwild, CA. Haley Reinhart (A lot of people like to hate her for some reason), 20 years old from Milwaukee, WI. Jacob Lusk (I’m not a fan of his, I really don’t get the appeal), 23 years old from Compton, CA. James Durbin (He undeniably has something, he looks really comfortable when he performs and it makes it makes his performances enjoyable to watch), 22 years old from Santa Cruz, CA. Karen Rodriguez (she seems like a good singer but I have yet to see the greatness in her), 21 years old from New York, NY. Lauren Alaina (I think she’s really good), 16 years old from Rossville, GA.
Naima Adedapo (wild-card selected by the judges), 26 years old from Milwaukee, WI. Paul McDonald (Quite the character, fun to watch), 26 years old from Huntsville, AL. Pia Toscano (Another one I think who is very good she kind of reminds me of Katharine McPhee), 22 years old from Queens, NY. Stefano Langone (Wild card, selected by the judges and one of my favorites), 21 years old from Kent, WA. Thia Megia (The Philippino teen, she can sing but I find her performances lacking. Maybe it’s just nerves, whatever it is she needs to get over it) , 16 years old from Mountain House, CA. 24 years old from Nashville, TN was eliminated tonight and did not get saved by the judges. This entry was posted in American Idol, American Idol season 10 by admin. Bookmark the permalink.